Recently, Chef Rachel, of the Healthy Cooking Coach, posted tips and tricks for freezing in glass jars. Some of her tips included leaving at least an inch of open space at the top, use wide mouth containers, and chill your liquid before freezing. She notes that she doesn't exclusively use glass, but that she has used it often and with great success, here. She also teaches you the money saving and health boosting tips of homemade chicken stock in her cookbook, The Garden of Eating Diet. Yesterday, I received a free chicken from Whole Foods, courtesy of a coupon mailed to my home. This chicken was small, but it created enough broth for several meals. 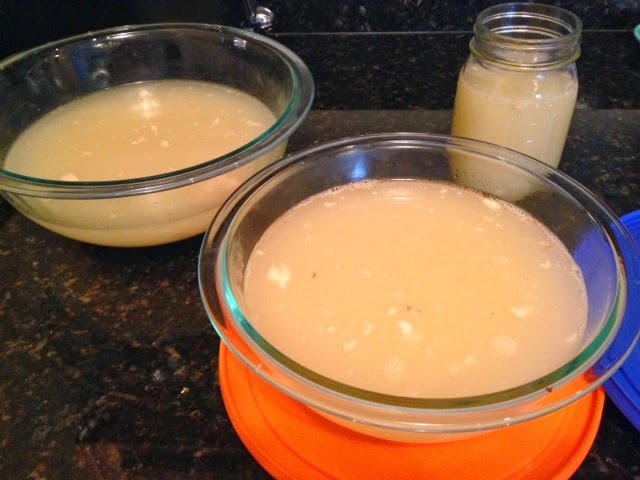 What you see is the straight concentrated broth, which can be diluted and spread out further. The method was very simple as I just cooked the chicken in water, bones and all, all day long. You can add vegetables (left over tops, skins and pieces of organic vegetables go great in this process for the last four hours of cooking), herbs, seasonings, or you can leave it plain and spice it up down the road. I let the broth cool completely, and I left ample space at the top of my jars. Next, I cooled the broth in the fridge before freezing. When I looked in the morning, everything was in tact, no cracks, and all is well. While I don't normally freeze liquids in glass, Chef Rachel's posts pushed me to try it and I am glad to have another option for safe food storage containers. I can see why this may not work for every situation (thinking of safe stacking, in particular), but for now, I am happy to house my healthy homemade broth in these lovely bowls and jars. Thanks, Rachel! And if you haven't check out Rachel's cookbook for fantastic recipes such as the homemade broth, the squash pie, and the hungarian squash soup (just to name a few).